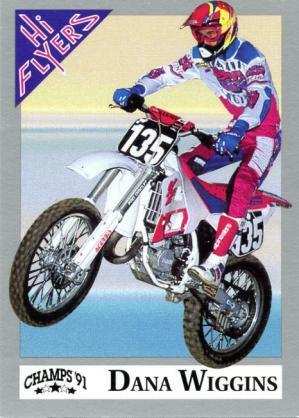 The best set we can remember were the 1991 Hi-Flyers cards produced by Champs, which was the parent company of a guy named Jeff Johnson's Rad-N-Bad company (the company also produced girls-in-bikinis-with-pit-boards posters—the motocross equivalent of Baywatch lifeguard posters). The cards were exceptional, with photos from all of the top U.S. riders, plus team cards like the OG Pro Circuit team of Jeremy McGrath, Brian Swink, Steve Lamson and Jeromy Buehl. 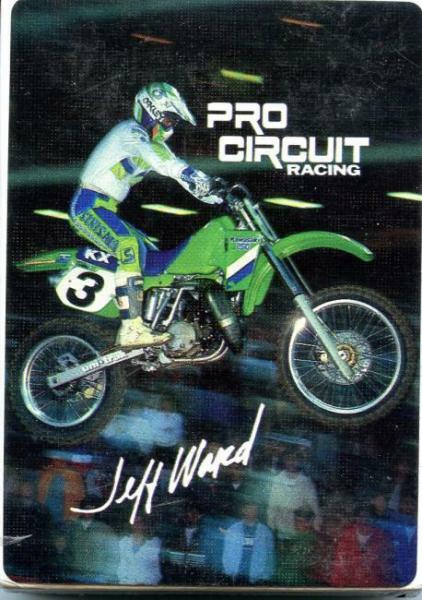 This cards became quite the collector's items, and featured riders like Dana Wiggins—now a Kawasaki factory mechanic—tell us they are asked about signing their card every now and then, more than two decades after the cards were issued! 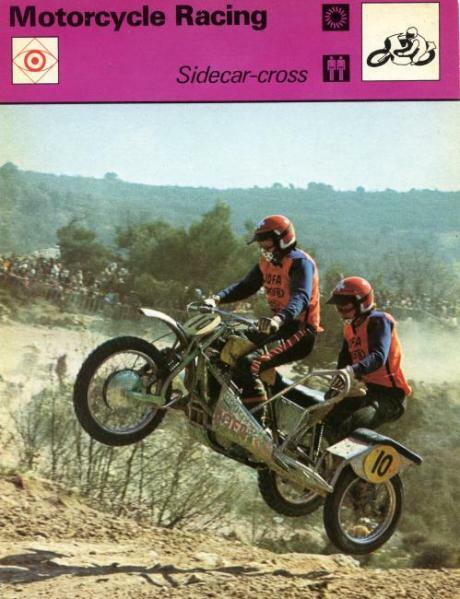 The Hi-Flyers reached too far in their second year, going for international riders, artists' renderings, and even “Rising Stars” like Robbie Reynard and Ricky Carmichael as amateurs. They also let independent and lower-level riders purchase their way onto the cards, which lessened their street cred considerably. The company owners seemed to be more into the style of the cards than the actual distribution, because in the end that's what makes small-return products like this work: wide distribution. The Hi-Flyers never returned with a third set. Produced in 2005 by No Limits Hard MX, with bike-and-booty photography by Rick Moore, these playing cards offered a bevy of factory race bikes and aftermarket beauties for you and your poker-playing buddies. The company also produced calendars, though by their website it appears that by 2011 they had changed their name to Flyte USA. But for a snapshot of what the bikes and the pre-Monster Girls looked like eight years ago, these cards were all aces. What prompted this whole column was the trip home from the Indy SX and a stop at a thrift store/garage that specialized in all sorts of motorsports and automobile/motorcycle travel pieces. They included this set of library-sized encyclopedia cards that featured all sorts of motorcycle racing sports and personalities, including Roger DeCoster, Joel Robert, Sidecar-cross, ice racing, “Moto Ball,” the old ISDT and more. The cards were produced in the late seventies by Editions Rencontre S.A. (Lausanne). The set we found was in mint condition. The price? $10. Score! Remember the awesome toy motorcycles that came out about a dozen years ago and could be found in department stores everywhere? 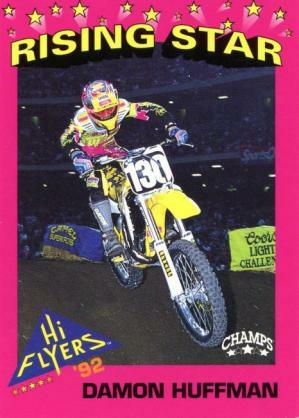 They were the Road Champs by JAKKS Pacific, Inc., and at one point the bikes were joined on the shelves by a set of trading cards that included all kinds of action sports icons, including Jeff Emig, Brian Deegan, Dave Mirra, Danny Way and more. 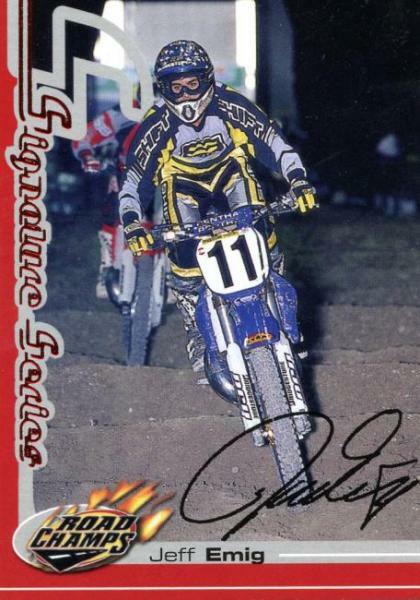 What's coolest about the cards is that Fro's was a shot from his last-ever professional win, the 1999 U.S. Open on his FMF-backed Strategic 3 Yamaha YZ250. 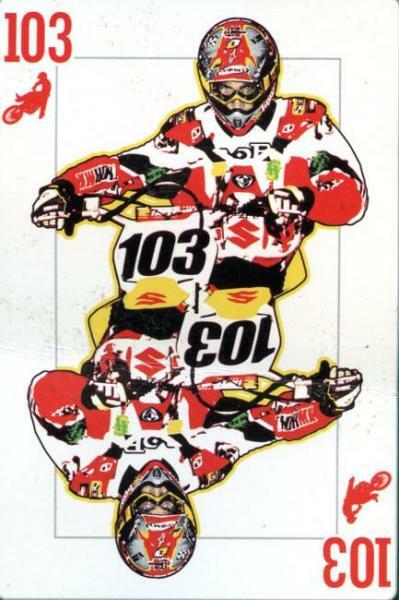 Speaking of Vegas, one of the coolest promotional pieces we remember was the artistic rider cards produced for the 2003 U.S. Open of Supercross at the MGM Grand. The cards included everyone from Chad Reed and James Stewart to Ricky Carmichael and Mike LaRocco. Technically they were never distributed in stores, but we definitely would have bought all of these if we only had the chance! Every year at Racer X, we try to come up with something cool to hand out, like cover posters, stickers, coasters—whatever we come up with and Julie Kramer approves! 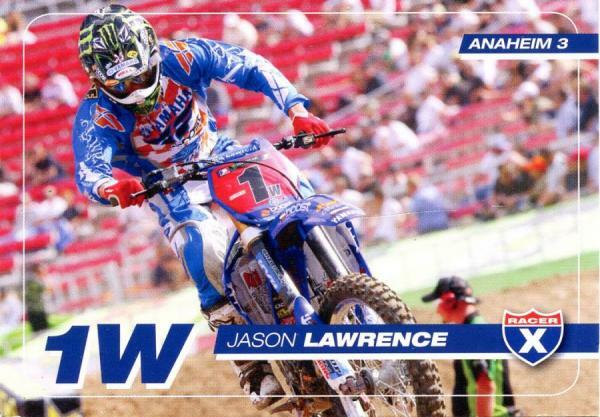 In 2009 we produced a set of trading cards featuring some of the top riders in Monster Energy Supercross, including this cat right here, defending West Region #1 Jason Lawrence. We still have a bunch of these in the office featuring 17 different athletes. One day we will do a surprise promo and give some sets away for your collection. 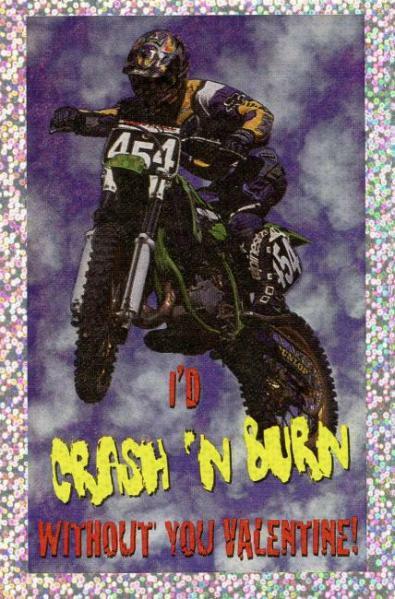 Maybe the goofiest cards we ever saw were these Valentine's Day cards by something called Mello Smello, featuring this #454 Kawasaki rider (Andy Bowyer? Carey Hart? Mitch Kumpstein?). They included this “Did You Know?” factoid: “The earliest motorcycle appeared around 1800 with iron-banded wagon wheels. They were called 'bone cushers' both for their jarring ride and their tendancy (sic) to toss their riders.” No, we did not know that, nor did we believe it—Gottlieb Dammler gets the credit for building the first motorcycle, 85 years after this card guessed. 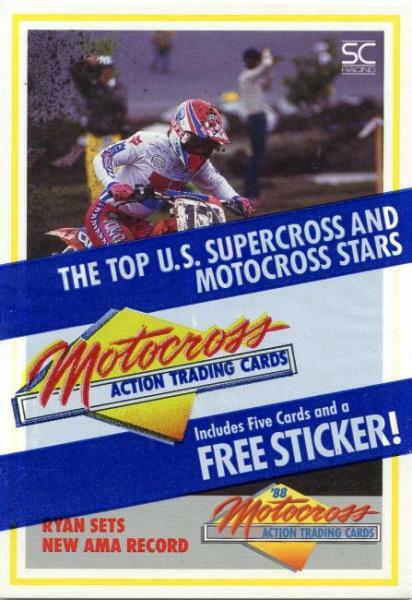 Credit the MXA guys for coming out with an exceptionally well-done line of cards in 1988 that featured the stars of the day, from Ricky Johnson to Ricky Ryan; Bader Manneh to Mike Healey. The cards were oversized, maybe twice the size of a normal trading card, produced by SC Racing. We have a few sets still in the package, as well as some uncut sheets. 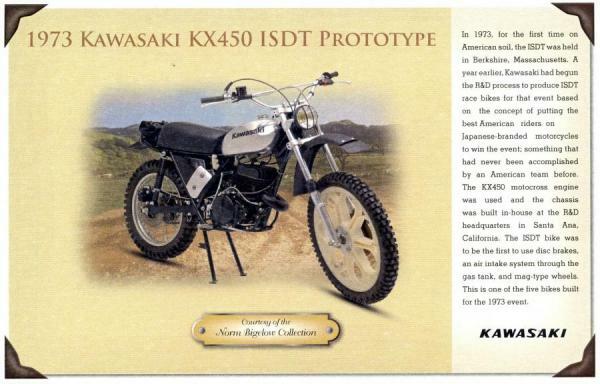 The guys at Kawasaki were involved with their own set of encyclopedia-type model cards that featured the history of their brand, and they featured some of the rarest of Kawasaki motocross and road racing pieces, many from the Norm Bigelow collection: We chose this one to display because that's what a KX450 looked like back in 1973! Wonder how Ryan Villopoto would do on that bike at Houston this weekend? 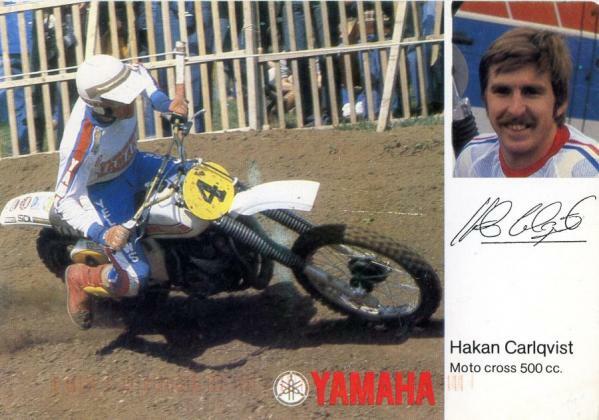 The factory team in Europe came out with these cards in the early eighties when Hakan Carlqvist of Sweden was their top dog. I wish we could tell you more about these cards, like the fact that there were releases for Danny LaPorte, Neil Hudson, Marc Velkeneers and more, but we can't because this is the only one we have! But we do have all of the late seventies Team Yamaha cards/stickers that included Hannah, Glover, Mike Bell, Rick Burgett and more. But we will hold those until it's time for a sticker list. Back to that thrift store/garage near Springfield, Ohio. 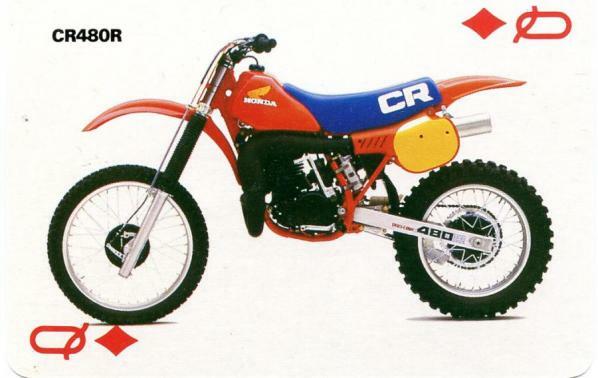 They also had a full set of “fact” cards that included dozens of different motorcycles from around 1990, from Aprilia scooters to this sweet Honda CR250 card featuring Jean-Michel Bayle. The cards were produced by Atlas Editions and Edito Service S.A., with this particular photo by Moto Journal's Nicholas Sonina. 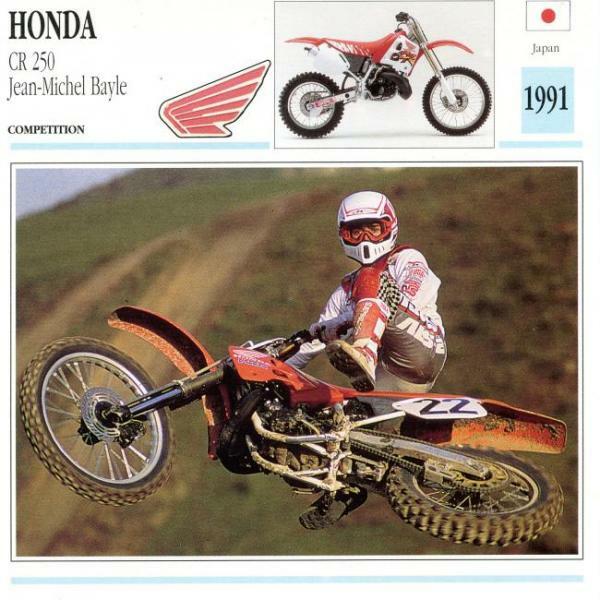 The caption for “Mister Motocross,” as they described JMB: “The Frenchman Jean-Michel Bayle, who became American champion in 1991, knows how to get down in the dirt.” Smart cards for sure! 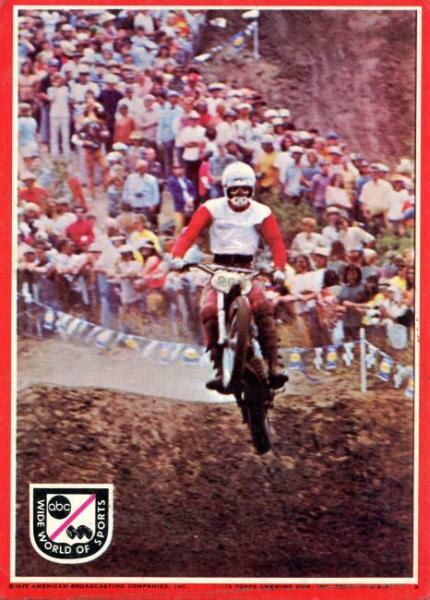 The rarest cards in the Racer X Collection are the three 1975 ABC Wide World of Sports cards featuring the Carlsbad 500cc U.S. Grand Prix of Motocross, the only race on TV back in the day. The cards were shot at the 1973 race and featured first-GP-winner Willi Bauer coming down off the drop-off, as well as this heavily photo-shopped card of (we think) Mike Hartwig of the Husqvarna team. Why the early Photoshopping? No idea. But we do know that these oversized cards were produced by Topps Chewing Gum Cards, the biggest company in the history of baseball and football cards. 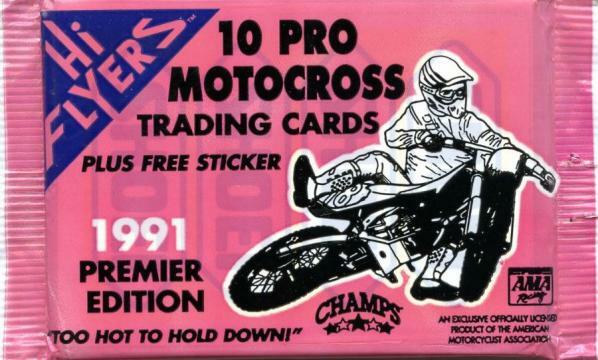 Hard to believe that the closest motocross got to mainstream trading cards was way back then.